You may have noticed that when a mortgage lender advertises an interest rate, they also quote an “APR.” What is this acronym, why does anyone talk about it, and is it really important? Here is a quick look at what the APR, or Annual Percentage Rate is, how it’s calculated, and why you probably shouldn’t rely on it too heavily. Where did APR come from? In 1968, Congress passed the Truth In Lending Act (TILA). They intended it to provide a way for consumers to compare different loans by looking at their real cost. To understand how APR works, you should be aware that there are certain costs associated with getting a loan. For our purposes, we’ll talk only about mortgages, although TILA applies equally to all kinds of consumer finance. For mortgages, these costs, called “prepaid finance charges,” include processing and underwriting fees, document preparation fees, discount points, mortgage insurance (both prepaid and monthly), escrow fees and wire fees. These finance charges are subtracted from the loan amount to arrive at the “Amount Financed.” The lender calculates the APR using that number, assuming you’ll keep the loan for its entire term. Are you confused yet? Yes? That’s what happens to most consumers! Here’s a simpler way to look at APR. The Truth In Lending Act was supposed to protect consumers from being misled. Before TILA, a mortgage lender could offer a very low rate, like 3% for a 30-year fixed rate loan, when most lenders were quoting 3.5%, then reveal at the closing table that there was a small catch to the deal—the borrower would be expected to pay 3% of the loan in discount points to get that low, low rate. Today, when you see an unusually low interest rate but a significantly higher APR, be aware of what you are really paying. There are some instances where a lender quotes a rate and APR that are the same number. This simply means that they are offering a rate that is high enough that they can and will pay those costs that normally figure into the APR, like processing, underwriting and escrow fee. It does NOT mean they are giving you some sort of gift (there is no free lunch, after all). There are a few assumptions that can make the APR less than useful for you as a consumer. Do you really think you will have that loan for the full 30 years? No? Then the APR calculation will be incorrect for your purposes. Are you considering an Adjustable Rate Mortgage (ARM)? If you are, the APR is even less useful, since the calculation assumes that the interest rate never changes—in fact, in many cases, the rate can actually go DOWN for the purposes of the calculation! This confusing situation is made even more complicated by the fact that some lenders may use different methods of calculation for their version of the APR. In some cases, they may neglect to consider certain costs out of ignorance or carelessness. Get an itemized fee breakdown from any lender you are comparing. Keep in mind that many of the fees, like title and escrow fees, are third-part fees, not lender fees. Compare the actual loan costs that each lender charges. Consider how long you intend to have the loan. If you plan to sell the house in a comparatively short time, you should keep your up-front charges low, even though it will mean a slightly higher interest rate. Do your comparing over as short a period of time as possible. Remember that rates change every single day. The cost of a $400,000 loan can fluctuate by $1,000 or more from one day to the next, depending on what is happening in the market. That fluctuation could mean that comparing yesterday’s quote from lender A to a quote from lender B today could be meaningless. Always remember that the person taking care of your loan—your loan officer and his or her team—is the single most important part of your transaction. Even though your loan scenario may seem to be a simple one, you should still know that you can contact your loan officer to answer questions or give you a progress report. Heavily marketed mortgage companies operating from call centers tend not to do so well in the communication department. One of the main reasons you may be investigating APR is for a mortgage refinance. There’s much more to a refinance than just getting a low rate, however. 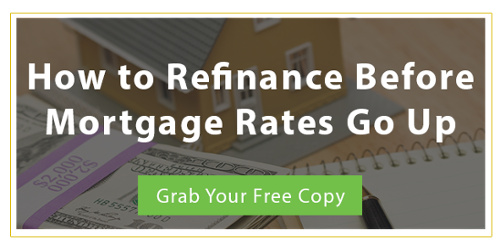 For more information on how to refinance, download our ebook by clicking the button below now.